In 2017, IPE started a collaborative research project on indicators of sustainability under the working title SUPER DONUT. The main pillar of the project consists in (1) critically questioning the conceptual underpinning of the widespread macroeconomic modelling of transition towards a sustainable social metabolism in the 21st century (with a special emphasis on societies on the Southeastern semi-periphery of Europe); and (2) choosing indicators of social metabolism and development suitable for a scientific understanding of the sustainable social metabolism and for communicating with various social groups. 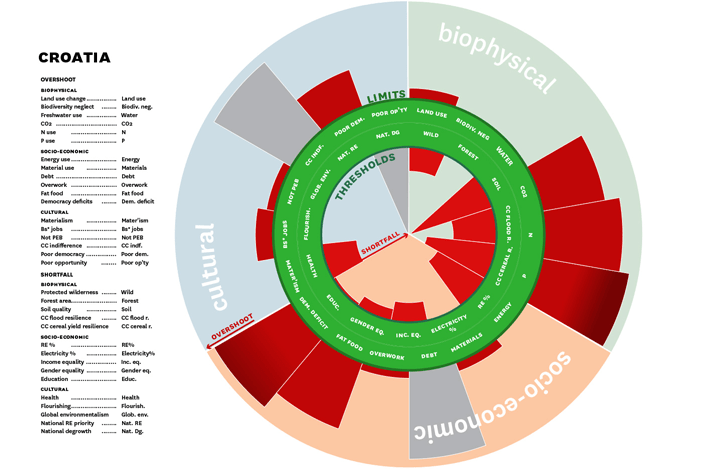 Simultaneously with the collection and analysis of data, as well as narrative and analytical justification of choices and normalisations of indicators, the team is developing modes of visualising indicators of sustainability along the lines of the ‘doughnut’ developed by Kate Raworth (Oxford). The indicators are presented as normalised values in the donut model, where the outer rim specifies the transgressions of known boundaries and the inner rim specifies shortfalls of desirable thresholds for a democratic society of significantly smaller environmental impact. Visual presentation of this indicator set is the essential communication tool of the research and advocacy activities of this project. Partial automation of the presentation of results for a broader range of countries is another activity under development. The project represents the umbrella research programme for quantitative representation of nation states’ anthromes’ degrowth potential, based on a selection of indicators of excesses and shortfalls within contemporary anthromes’ metabolism. An anthrome, anthropogenic biome or human biome is a terrestrial space co-created by resident and transient humans and the rest of nature. States, political, economic and cultural units are also specific anthromes due to their living populations and throughput of materials and energy associated with them. Human population now has a pervasive influence on the terrestrial biosphere, replacing climate and geology in shaping sustainability of ecosystems, and so justifies the project’s focus on the indicators related to energy-materials throughput of the economies and socio-cultural values and attitudes prevalent in the human society. The project aims to select the indicators depicting excesses and shortfalls of biophysical, socio-economic and cultural performance of human societies within the state-defined anthromes, from the perspective of the bright degrowth society envisioned in the second half of this century. The project consists of a fluid research team led by Dr Mladen Domazet with current in-house contributions by Andro Rilović, Oxana Lopatina, Lana Pukanić and Vedran Horvat. Visiting fellows Dr Giacomo D’Alisa, Lilian Pungas and Valentine Porche have contributed during their stay. ISRZ’s Dr Branko Ančić and Zagreb University’s Dr Marija Brajdić Vuković are principal investigators in social sciences. Furman University researchers, Dr Brannon Andersen and Dr John Quinn, and interns Logan Richardson and Sophie Brennan contribute expertize, data collection and analysis in environmental sciences and sustainability. Joško Gamberožić and Ivan Katanović lead the development of the automated visualisation tools and graphic presentation of output.